Gargling with warm saline water eases the pain of a sore throat. Mix a teaspoon of salt in warm water and gargle with it 2 to 3 times each day when you experience symptoms of a sore throat. Herbal marshmallow and cheeseweed (in the mallow family) are often used to remedy stomach pains and sore throats. 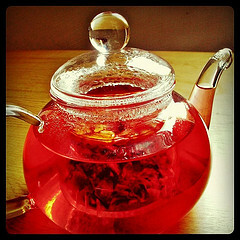 One common method of use is to include the leaves of either herb in a tea or tincture. The viscous quality of the mallow herbs makes them ideal to soothe the mucosal linings in our bodies. Slippery Elm has similar properties to marshmallow and is one we carry in our office. This herb is also found in “throat coat” tea, in lozenge form, and tablets and capsules. Its viscous properties help the mucosal lining of your throat to relieve soreness. Fresh ginger, when taken in tea form, helps treat upset stomachs, colds, and of course, sore throats. Ginger has anti-inflammatory properties that target bad bacteria, and it can also help flush toxins from the body. Grating ginger into a cup of warm water or tea, or using the powdered form, is a simple way to create a soothing drink for a sore throat. Soak a hand towel (or wash cloth) in HOT tap water. Wring it out very well and wrap it around your throat. Leave in place for 2-3 minutes. Then soak another hand towel (or washcloth) with COLD tap water. Wring out the towel very well. Remove the hot towel from your neck and place the cold towel immediately around your neck. Cover the towel with Saran Wrap and a wool item (either a scarf or sweater) to retain the heat. Leave it on for 45 minutes or all night. Repeat 1-2 times a day. Oxymel, or our “kick-a-bug-juice,” is a mixture of honey, water, vinegar, and spice that is boiled and reduced to a syrup. Combining the properties of many soothing ingredients into a drink creates a home remedy ideal for treating sore throats. And here’s how you can prepare your very own Oxymel at home. Peel garlic cloves and cut in half. Boil garlic in 4 cups of water until translucent. Drink 1/3 to 1/2 cup, warm liquid 2 to 3 times a day, eating at least 2 cloves of the cooked garlic with each serving. *Oxymel may be kept covered in the refrigerator for 4 weeks. Do not give honey to children under 1 year old. With your army of herbs at the ready, you will be able to withstand the grizzly effects of a sore throat. If you have any questions or need some extra tips on remedying your sore throat, contact us at info@carolinasnaturalhealth.com.